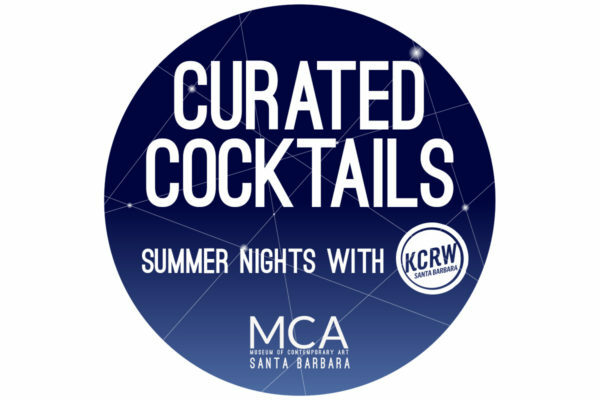 Enjoy the beauty of warm summer nights, art, and music with a live set from a KCRW DJ Mathieu Schreyer at MCASB. Located on the beautiful Paseo Nuevo Upper Arts Terrace in the heart of Santa Barbara, Curated Cocktails: Summer Nights with KCRW, features unique themes inspired by the current exhibitions Free Play and and Bloom Projects Exchange Series: Silvestre Pestana, Breathless, after-hours museum access, signature cocktails, and interactive art making with Sondra Weiss. Special thanks to Eureka!, August Ridge Winery, Telegraph Brewing Company, and KCRW. Part of Downtown Santa Barbara’s 1st Thursdays.